Boeing Stearman Model 75 is a biplane. It was used as a military training aircraft during the 2. WW. At least 10.626 were built in the US in the 1930s and 1940s. The Stearman Aircraft became a subsidiary of Boeing in 1934. Boeing Stearman or Kaydet, worked as a primary trainer for the Army and Navy. The plane’s body is constructed with a steel frame covered with fabric, wings and tail surface is constructed of wood (spruce) also covered with fabric. The aircraft is a tail wheel aircraft, with a high center of gravity and a high wind resistance which makes it challenging to land especially in crosswind. The pilot sits in the rear cockpit and have limited visibility ahead at takeoff and landing. This meant that the pilots received special training in this. A valuable skill in the transition to fighters with the same challenge. The plane was also used as an aerobatics trainer. Extremely solid built and can withstand high stress. Because of this powerful construction, the plane quickly got a reputation as a safe training aircraft, with a good chance to survive serious casualty. During World War II two planes crashed in the landing pattern and both the pilots survived. This says a lot about the aircraft construction. During World War II 800.000 allied pilots received their basic training on the Stearman in the US. In 1941, a new Stearman rolled out of the factory in Wichita every 90 minutes. After the Second World War, thousands of surplus planes were sold on the private market. They were used as crop dusters as well as sporting and aerobatics planes with wing walking at airshows. 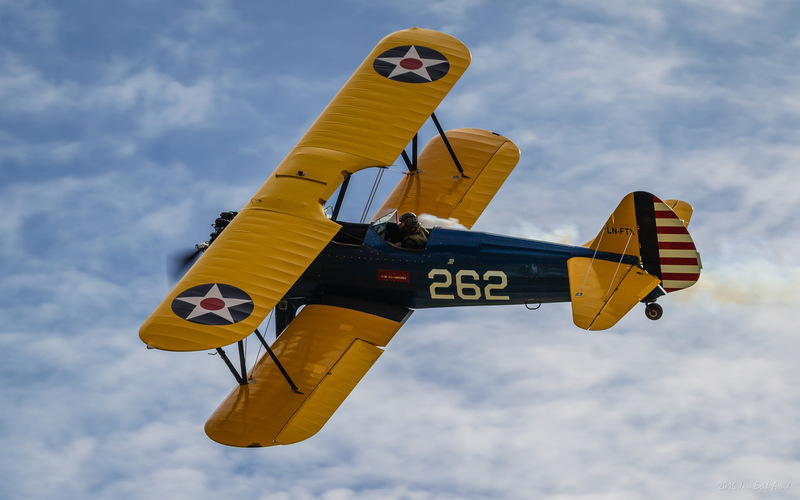 Today there are about 600 operational Stearman planes in private ownership. This particular plane is stationed at Notodden Airport and owned by Scandinavian Aircraft AS. Aircraft Norwegian registration LN-FTX.